As the geographical spread of an electricity system increases, the wind speeds across it become less correlated. Some areas will be windy, some will not. At a particular time, some areas will have rising power output; some will have falling power output. The effect of aggregation on wind farm power fluctuations, and on capacity credit issues, has been looked at by several analysts, and forecasting of the output of large numbers of wind farms for the System Operator is now commonplace in Denmark, Germany and Spain. As can be imagined, forecast accuracy for portfolios of wind farms is better than for individual wind farms. An example time series plot of the forecast accuracy of a portfolio of seven geographically dispersed wind farms is presented in Figure I.2.16. 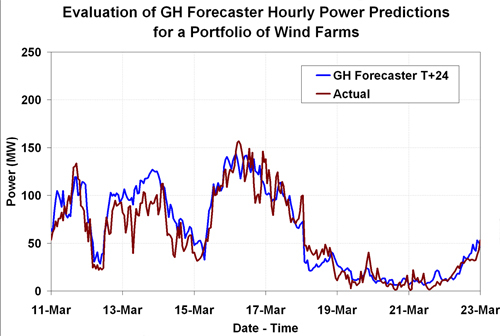 It can be seen that the average deviation of the forecast is significantly lower than that for the individual wind farm example presented in Figure I.2.14, despite the portfolio being forecast 24 hours in advance rather than 12 hours. It would be typical for the mean absolute error of the forecast 24 hours in advance to be 3 to 5 per cent lower for a portfolio of seven wind farms than that for one individual wind farm. As forecasts are extended to include all wind farms in a region, such as a part of Germany or Denmark, where densities of turbines are high, then mean absolute errors of 5 to 7 per cent are seen even 24 to 48 hours in advance.